Robert Rodriguez’s Machete lives up to its trailer released earlier this year. “This is Machete with a special Cinco de Mayo message … to Arizona,” the star of the grindhouse movie, played by Danny Trejo, growls at the start of the trailer. He then engages in bloody mayhem and mass murder. 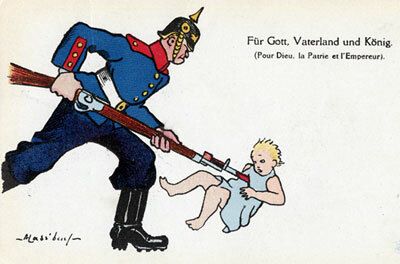 World War One propaganda poster depicting Germans as baby killers. Rodriguez’s film portrays the border Minutemen in much the same light. On Friday night, Alex Jones took his crew to see Machete at a theater here in Austin, Texas. The movie lived up to and even exceeded expectations. Machete is not satire. It is propaganda under the cover of an exploitation film. It is designed to stir up “visceral” reactions to the very serious issue of illegal immigration. It strives to demonize Americans outraged over an open border and the influx of millions of illegal aliens every year. Machete portrays members of the Minuteman Project — an activist organization founded in 2005 by James Gilchrist — as racist thugs and serial murderers. The Minutemen are not directly named. Instead, the border patrol group calls itself the “Vigilantes,” but the comparison in unavoidable. Alex Jones reviews the Machete script. A few minutes into the film, the border Vigilantes — including a corrupt Texas politician played by Robert De Niro — murder a pregnant illegal woman as she crosses the border. The scene is an example of classic war propaganda. The murder of a defenseless pregnant woman in the film is designed to elicit a visceral and emotional response on the part of the audience. It far surpasses the “ravishing” of maidens by evil Huns portrayed in pro-war posters during the First World War. It ranks right up there with photos published in newspapers prior to the Second World War showing sadistic Japanese soldiers skewering Chinese babies with bayonets. Such images were instrumental in convincing the American people they should support entry into the war. Rodriguez’s message is clear — if you oppose illegal immigration, support the activism of the Minutemen, and agree that states should adopt laws like Arizona in response to illegal immigration, you also support shooting pregnant Mexican women. Polls reveal that most Americans by large margins support the Arizona law. “A solid majority of Americans back Arizona’s tough crackdown on illegal immigrants,” Reuters reported in May. Eight in 10 Americans are concerned that illegal immigrants burden schools, hospitals and other government services, and 77% worry that they drive down wages, according to a USA TODAY/Gallup poll, also conducted in May. Despite its obvious cliches and racial stereotypes, a climatic scene near the end of the movie calls for a bloody revolution against the Vigilantes, aka the Minutemen and their supporters, or for that matter Americans who want to deal with illegal immigration in a lawful manner. During the scene, we see a large number of Mexican laborers using the implements of their trade to attack the Vigilantes. The scene has an ominous parallel — in April, the Americans for Legal Immigration PAC released a video showing an illegal alien supporter in Arizona claiming that shovels and axes will be used against Americans. “We will not stop! We will take up our shovels and pickaxes and we… will use them against you! Believe that!” screams an opponent of Arizona’s tough new bill addressing illegal immigration in the video. Following charges that he was attempting to stir up a race war with the release of his “Cinco de Mayo” trailer, director Rodriguez promised to tone down incendiary aspects of his film. After Alex Jones received the Machete script and pointed out the race war elements, Rodriguez said his critics have jumped to conclusions. The theatrical version of Machete is true to the leaked script, with one notable exception at the end of the film. Robert Rodriguez’s Machete is an obnoxious exercise in misinformation. It calls for a violent response to the political activism of Americans — including Hispanic Americans — opposed to wide open and lawless borders and the assertion by many Mexicans that the American Southwest was stolen from them by the United States. Machete is primarily about illegal immigration — specifically framed by the “Cinco de Mayo” trailer — and is Rodriguez’s answer to the acrimonious debate over Arizona’s effort to stem the tide of illegal immigrants bankrupting the state. Rodriguez has cynically shrouded his message — violence in response to border “vigilantes” is not only acceptable, but preferable — under the cover of a Mexploitation film. It remains to be seen if the film, now showing in theaters around the country, will result in violence.